According to survey Hostgator is the most sterling and largest hosting company in the world and also working in India for providing hosting services to the Indians. Hostgator's Indian office is in Nasik, Maharashtra which provides 24×7 technical hosting, customer and billing support and Data Center in Mumbai and Hyderabad. In this article we will discuss about "Why HostGator India Is Best Indian Web Hosting". Hostgator India is very useful for Indian Bloggers & Webmasters as there service located in India and you can get all Indian support and payment options. Users can easily use many Payment options to pay. Indian customers have to pay service tax of 12.36% to follow the Indian Govt. rules. Every person looks for benefit or advantages of any service before purchasing. Here I'm sharing advantages of HostGator India services. 1. Low Latency and Ping: Hostgator India's data center located in India, so lowest ping and latency and site will load faster. 4. SEO Advantages: If you have website designed for India or Asia, you get better rankings when the site is hosted locally. We will keep you updated as soon as Hostgator will add more features or offers. So, keep in touch with us. However any web hosting purchased from HostGator or HostGator India give you 45 days of money back guarantee. 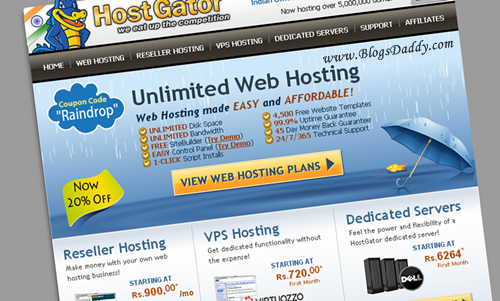 Click here to order your web hosting from HostGator India. If you are already using HostGator India share your experience or ask us if you have any doubt on Web Hosting and our Free Services via our commenting section below. I am also an Indian blogger and webmaster, I would love to know your views about Hostgator India: Premium Web-hosting for Indian webmasters by Hostgator? You can use coupons for hosting purpose not for domains.